Devoted to the Wonderful Possibilities of the Human Family and the Godly Powers Within All. Helena, MT. Publisher: State Publishing Company; New Thought Library Rooms. Editor: Dr. Anna Beckwith Hamel, V.M.D. 1/1, March 1905. 17-21 pp., initially free, then $1.00 a year (though Hamel offered as a premium to every subscriber for three months a life horoscope "prepared by the noted author, palmist and astrologer, The Prince," who was almost certainly Hamel herself, who listed herself in the business directories as a palmist). 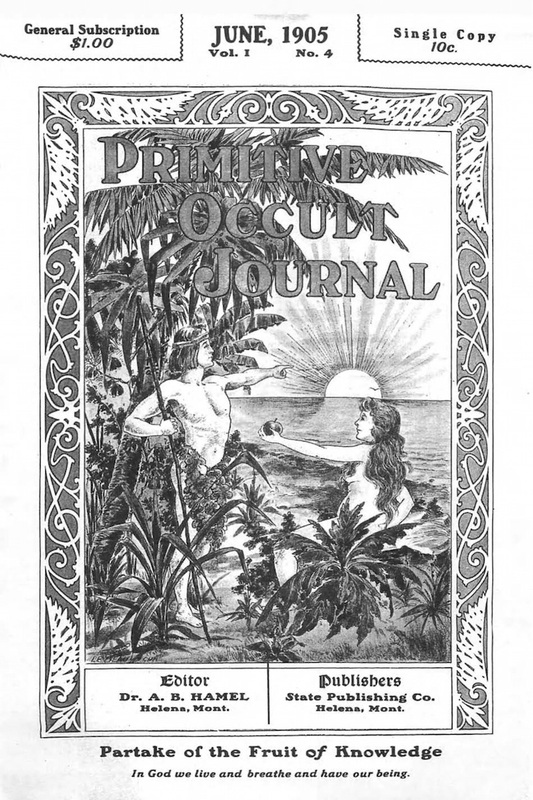 "Primitive" in the journal’s title meant for Hamel "simple" and was used to indicate that the version of New Thought taught was stripped of complications and reduced to healing, positive attitude, and uplifting affirmations or well-being. Hamel was a dynamo of New Thought energy in Helena. She identified herself in the journal as "Manager New Thought League," "'New Thought' Librarian of the New Thought Library," and "V.M.D." (a doctor of Vitaology). This was a system originated by Professor Thomas F. Adkins, Dean of the New York Institute of Physicians and Surgeons, of which Hamel was a graduate. This method "enables you to cure yourself of any ailment without Medicine," and Hamel both practiced it in her Vitaology Clinic next to the library and (for $5.00) taught by mail order. The content of the journal, besides daily affirmations and small discourses on New Thought, was largely filler: beauty tips, advice on "How to Get a Husband and How to Keep Him," notable cases of longevity from the newspapers, a romantic tale of a young Austrian Count’s overcoming obstacles to marry an "American Jewess," and encomiums for "that great and successful man," John Alexander Dowie in his Zion City. The author of the notice of the journal in To-Morrow, 1905, obviously at a loss for something to say about the journal, says that it "contains an attractive portrait of the editor, who, by the way, is a woman and writes good poetry." Listed in Bulletin of Bibliography, 1905, and in Henry Ormal Severance, A Guide to the Current Periodicals and Serials of the United States and Canada (Ann Arbor: George Wahr, 1907), 212. Montana Historical Society (1/1-7); UNC, Chapel Hill (1/5).